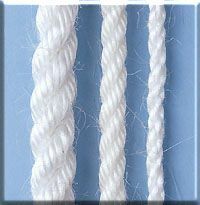 8mm Staple spun rope . Applications: mooring, towing, fishing, pick-up lines, lifting slings, general purpose use. Length is 220 meters. Colour is white. Soft laid 'hairy' buoyant ropes for marine moorings, holds knots well and is strong, it is also ultra violet resistant, splices easily. Weight - 6kg.